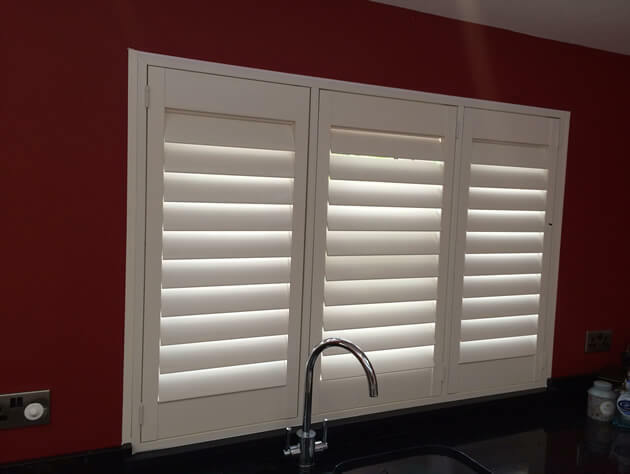 Ben and Jamie were on hand to fit some amazing shutters for a kitchen in Chislehurst Kent. 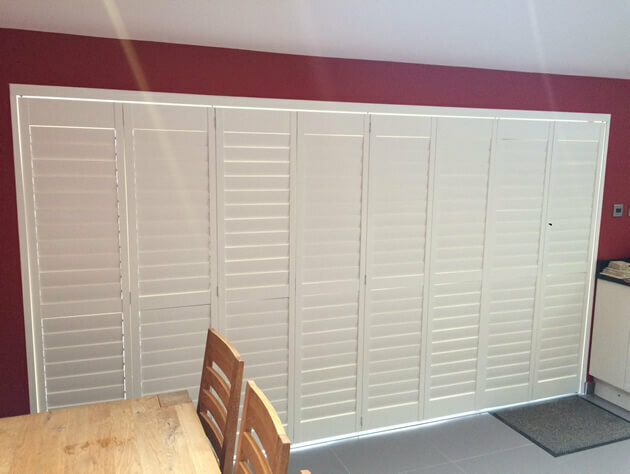 The owner was looking to have the kitchen area fitted with our shutters, which included a wide backdoor area and window above the sink area. 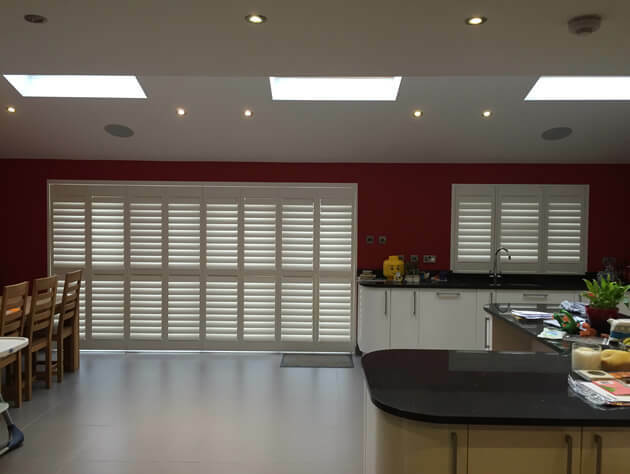 Our shutters are a great way for the home owner to further enhance their great decor and also take advantage of the fantastic light control that our shutters offer. The full height shutters for the backdoor area run the whole length and have patio doors behind. 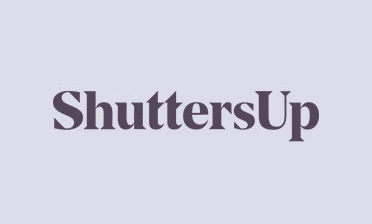 The shutters can be fully opened, closed or adjusted anywhere in between. 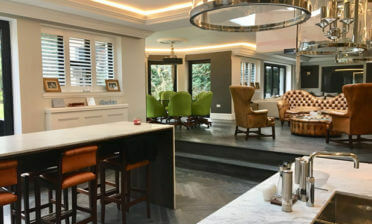 With a mid rail the shutters can be adjusted separately on the tops and bottom allowing for greater flexibility when adjusting for light and airflow. Using a track system the shutters can be opened to each side allowing full access to the doors behind and full access to the patio in the warmer months. Above the sink area the shutters are also in a full height style but without mid rail. Roughly half the size of the backdoor shutters the style flows nicely with the shutters fully matching. 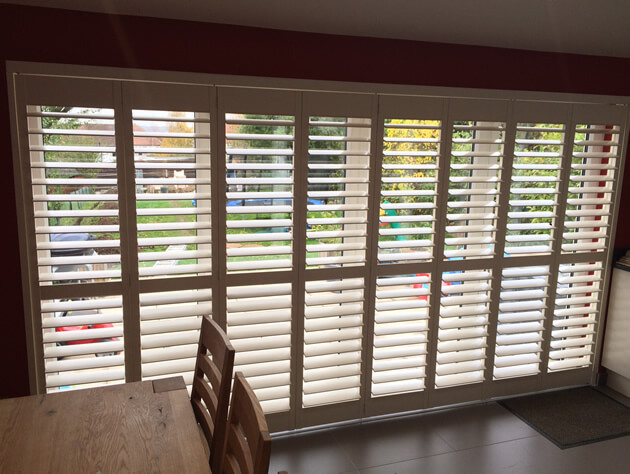 Both sets of shutters have 89mm louvres with hidden tilt rod systems which allow for the homeowners to adjust the shutters by touch, rather than using a visible rod system. 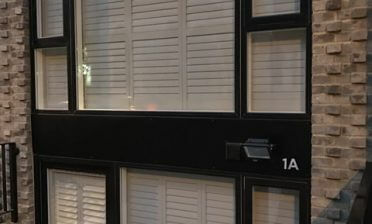 The shutters are fitted within a 4 sided deep plain L frame. We created all shutters from our Cuba Range of materials which is an environmentally friendly solution and both lightweight and rigid. Using hardwoods with linear grain these are ideal for painting, with these bespoke shutters being finished in a Pearl colour with hinges of the same colour!